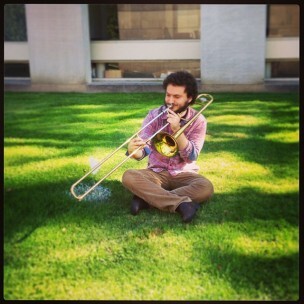 Ben Zucker ’15 talks music on campus and shares his goals for his senior year. Thinking philosophically about both music and the greater world is a daily practice for Ben Zucker ’15. So of course, the music major and Renaissance man agreed to wax poetic about song-making, people, and the interactions that make Wesleyan a unique place. The Argus: What are you involved with on campus? Ben Zucker: Well, let’s see…primarily, probably what campus knows me for is music. I’ve been involved most publicly as a member of Don Froot, this band that I’m in with Justin Friedman [’16], Matt Chilton [’16], Jonah Wolfson [’17], and Leo Grossman [’16]. We play jazz, world music, indie pop kind of stuff. I’m also a member of the Mixolydians, an a cappella group, and now the Mazel Tones. Sometimes I feel as though a lot of my activities are in a lot of little, smaller places, like playing piano for dance classes, or playing in the jazz orchestra, in Anthony Braxton’s ensembles, and just generally working a lot with the music department as [a] composer-performer of the experimental music that the department does. There’s also theater. I’ve done a lot of work with the department and Second Stage, usually composing music for theater, which is probably where I got myself started, but also as an actor in Little Shop of Horrors and The Library Project, so that’s been really fun. I’m also the Editor in Chief of Pyxis Magazine, Wesleyan’s undergraduate humanities journal, and I am part of the Unitarian Universalist Campus Ministry. So, a lot. A: How did you get involved in the music scene on campus? BZ: I transferred here from Bennington College, which is fantastic and allows you to do pretty much whatever you want. It’s remarkably creative, but also remarkably small, and I found myself, in my freshman year, running into the walls of the place very quickly. So I came to Wesleyan because I wanted to work with Anthony Braxton, Alvin Lucier, and Jay Hoggard, the three musicians who I felt I had a lot in common with in what I wanted to do. So, I got here and knew that I wanted to throw myself into things quickly, so I joined Braxton’s ensembles, started taking lessons with Jay, and joined jazz orchestra. I did a lot of stuff first semester. I took six classes, one of which was the faculty show, where the guest artist was Rinde Eckert, making music for his original production. It was varying levels of insane, but it was through these initial experiences that I just branched further and further out, running into new people, and I guess as word of all the stuff I did spread, it just kind of snowballed from there. A: So, I wonder what your major is. BZ: It’s obvious that I’m a music major with the Social, Cultural and Critical Theory certificate. I feel that the two work very well together; they have served as two reference points for a lot of reading that I do on my own time. I spend my time sometimes having JSTOR parties, reading Wired Magazine, a lot of nonfiction. I’m trying to get back into some weird poetry and fiction. The music major is kind of funny because sometimes I think some of the best musicians on this campus don’t have anything to do with the department. It feels like there are a lot of separate worlds that need connecting, and I feel lucky to keep my toes in the world of the music major and also outside of it, where sometimes people don’t overthink everything they’re doing and are just having a good time and trying to connect with people who just need something to dance to, or don’t need to analyze everything. A: What’s your favorite class been? BZ: That could go a lot of different ways. My classes with Anthony Braxton were incredible, just for being able to hear what he had to say about all different topics of music filtered through his own experience and his personal language for everything. A lot of people can go through his language and never understand what he’s saying, but it is inspiring to hear someone so accomplished doing what he wants to do on his own terms. Topically, Wagner and Modernism with [Associate Professor of Art History] Katherine Kuenzli was an amazing class. [We studied] the history and the results of the idea of the total work of art which touched into aesthetics, philosophy of romanticism, fascism and music and art and literature, so it was a nice way to branch out, in a seminar setting. There’s also been [Associate Professor of German Studies] Ulrich Plass’s The Ends of Empire: Narratives of Culmination and Decline, and Andrew Colwell [GRAD]’s How Ethnomusicology Works. I think what all of these have in common is both having a diverse set of material to find new connections that are hard to think of on your own, and taking a self-critical look at these materials in a way that reflects onto your own experiences. That’s kind of what you want in a liberal arts education. A: What are your best memories of Wesleyan so far? BZ: You run through the gamut of emotions and times at Wesleyan. Probably some of the best have just been nights spent reading curled up in Olin, or doing nothing on Foss. Conversely, my best memories have been some really exciting activities, like working on The Library Project last fall, that time I was in a marching brass band around Foss last 4/20, wandering through Hurricane Nemo, and midnight in the middle of the storm looking for parties. There’s just all kinds of stuff. I’ve tried to be as nice and interested and interesting as possible, because really here at Wesleyan, human connection, as it does everywhere, runs a lot of things, because this is a school where it’s big enough to know of a lot of people, but not necessarily small enough to know everyone. It’s nice that there are so many people to get to know, talk to, have memory-making experiences with. That’s kind of a conduit for enriching the rest of what you do here. I’ve always thought that personal development and artistic intellect development go hand-in-hand. I think that’s how I’ve made the most of my time here. I am secretly and not-so-secretly an incredibly anxious person, and I’m always freaking out about, “Am I living it up? Where are my friends? Who are my friends? Do I have friends?”, but what you have to do is just keep being yourself and it works out pretty alright. A: Is there anything specific you want to do before you graduate? BZ: Probably everything, but that’s really unreasonable. I want to dance again. I was involved in dance my freshman year, but then I transferred and that kind of went out the window. I don’t know, Terp, or something. I guess go to more lectures, especially readings and presentations of things that I don’t know about, before it’s too late and my world narrows itself. Probably mostly to make the most of my time spent with people here. And, of course, to play as much music as possible. Maybe, like, start another band or three, do some more concerts. As someone who is so music, I haven’t performed as much as I’d like to. I need to learn how to sustain myself as a performer. I’m doing my first solo show later this month at Earth House. It’s something for Sean Winnik [’14]. It’s exciting but also completely terrifying because I no longer have an ensemble to fall back on, and I only have two hands, and you can only do so much with those two hands. So that’s a lot of stuff that I want to do and more importantly can make happen. A: Do you have any plans for after you graduate? BZ: I love the Music Department, but besides from working with the graduate composers who have been an amazing resource, I haven’t gotten as much composition training as I’d like. I spent my summers augmenting this with time spent at the Banff Centre in Canada, IRCAM in Paris. So after school, I’m probably applying directly to master’s programs in music composition, looking into the hotspots for new music, like Yale, NYU, Mills. I’m also applying for the Marshall Scholarship to go over to the UK because London would be an amazing place to make music, maybe even more so than New York, which I’ve heard has a way of destroying your soul, and I’m not ready for that yet. My plan is just to keep on doing what I’m doing, and then eventually turn that into loving. A: What do you think you’re going to miss most about Wes? BZ: The fact that just no matter where you are on campus, you will run into somebody you know. It is something that I take for granted a lot, it’s going to be very different outside of Wesleyan. I’m going to make it last, and with any luck, it’s not such a jarring transition. I think the real world is a pretty cool place.